Samsung NU7300: is this curved 4K TV worth buying this Black Friday? | What Hi-Fi? Samsung NU7300: is this curved 4K TV worth buying this Black Friday? 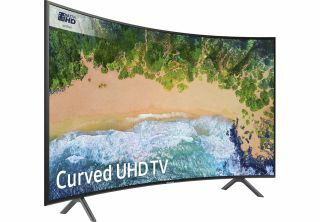 Wondering whether it's worth picking up a curved telly this Black Friday? No? Well perhaps you should! While curved TVs aren't universally loved, they're not entirely without benefit and there are some out there who love them. With the Samsung NU7300 down to just £449 this Black Friday, you might too! The short answer: Curved TVs aren't for everyone, but in our experience they don't have a negative effect on your enjoyment of the picture and, for some people, they can actually enhance it. The people we're referring to are those who sit quite close to their TV, which can give a curved TV a slight wraparound effect and create a small benefit to immersion. The people most likely to use their TV this way - and benefit the most - are gamers, and for them the NU7300 has myriad other benefits, such as a 4K resolution and HDR support, both of which are necessary to get the best out of a PS4 Pro or Xbox One X. Low input lag is a staple of Samsung's modern tellies, too, and ensures button presses are quickly translated into onscreen action. Non-gamers might be interested in a curved TV simply for style reasons, and that's fine, too. It is worth mentioning, though, that the NU7100, which is similarly-specced but flat, is even cheaper than the NU7300. You should also consider the Philips 50PUS6703, which we gave an Award at £599 and is available right now for just £399. The Samsung NU7300 is part of the 7-series of TVs, below the QLED range and 8-series, and is actually available in three sizes: 65in, 55in and the 49in model we're looking at here. Resolution is 3840 x 2160 (or 4K, or Ultra HD, or UHD - whichever you prefer) and HDR is delivered in HDR10, HDR10+ and HLG varieties, covering every base except Dolby Vision. As it doesn't have a QLED panel, the NU7300 uses LCDs rather than quantum dots, with a micro-dimming LED backlight. That's very much to be expected at this sort of price. The NU7300 also gets the same operating system as Samsung's QLED models, and it's colourful, quick and comprehensive, featuring all of the streaming apps you're likely to need. Netflix and Amazon Video, BBC iPlayer, Google Play Movies & TV and even Now TV are all present and correct. If you like to get your TV the old fashioned way, there's a Freeview tuner on board, and around the back of the set you'll find three HDMI sockets for your games console, PVR and/or Blu-ray player. We can't be definitive about the NU7300's performance as we haven't tested it, but we've liked Samsung's curved TVs in the past and have no reason to think the company's taken a step back here. Verdict: If curves aren't your thing, fear not - there's a flat version of this TV available for even less. But if you're someone who sits close to their telly or you simply like the look of the curve, there's no reason not to spend the extra £50 on the NU7300. And as a gaming monitor, it should be pretty great. That said, we haven't reviewed this specific model and there is a 50in TV that we absolutely love that's available for even less - the Philips 50PUS6703. That's a TV we can wholly recommend.